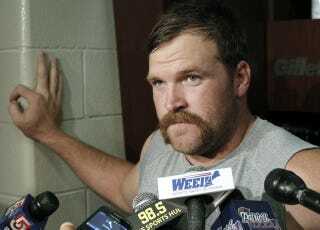 How Did Logan Mankins Play An Entire Season With A Torn ACL? Last week, we learned via Adam Schefter that Patriots offensive guard Logan Mankins played the entire 2011 season on a torn ACL. Mankins, who sustained the injury in New England's season opener, finally had surgery to repair the ligament last February. Until then, however, the injury hadn't been diagnosed and, as Mankins recently told WEEI, "no one knew." How is that possible? Usually, a cruciate ligament tear (even a partial one) would immediately end an athlete's season and perhaps even affect the rest of his career. But Mankins played all 16 games in 2011. Leaving aside the pain he must have endured, how could Mankins—a 6-foot-4, 310-pound man—physically function after rending an integral part of his knee? We emailed Dr. Ron Noy, an orthopedic surgeon and sports medicine specialist at Prestige Sports Medicine, to get his opinion. He believes that if Mankins's upper leg muscles were in excellent shape, he could still perform with a torn ACL. Noy said in an email: "It is entirely possible that a player could play a long time with a partial tear that left the knee only minimally loose that he was able to compensate for because of significant quadriceps strength." Although Mankins could play with a torn ACL, "it does put him at a higher risk of further injury," Noy said. It wasn't 100 percent, but it was still functionable. I could still run, so there was no reason to sit out. There were no MRIs or anything, so we never knew what exactly was hurt. If you could still run and play, there's no reason to go see a doctor, right? Without additional examination, an athlete might mistake a serious knee injury for a lesser annoyance, Noy explained: "In the acute setting of the game, if the tear was minor in that the knee did not partially come apart as in the typical full ACL tear and the ACL did not tear in such a way that it bled filling up the knee joint quickly with blood, the player would think he had a minor sprain of the knee and most likely be able to continue to play." Noy went on: "If the thigh muscles are very strong and the partially torn ACL heals with only minimal to mild laxity, the player has a good chance of playing a whole season even without a brace." Moral: If you tear your ACL, just make sure you're strong as hell and have superhuman tolerance for pain. You'll be just fine.